This is the easiest way to hit a home run with your pellet smoker. Brining the chicken makes the meat super juicy, and smoking on low gives the chicken a smokehouse flavor without taking all day. I recommend hickory or competition blend pellets for best results. 1. Rinse whole chicken legs in cold water. 2. Fill heavy-duty gallon zipper lock baggie half way with water. 3. Add 1/2 cup kosher salt, then mix until thoroughly dissolved. Add water if necessary. 4. Add chicken to brine, then top off with more water. Burp and seal baggie. 5. Place chicken in refrigerator for 2.5-4 hours. 6. Set smoker to Low Smoke to warm up. 7. Remove chicken from brine, and thoroughly dry. 8. Liberally sprinkle salt and pepper over every square inch of skin. 9. 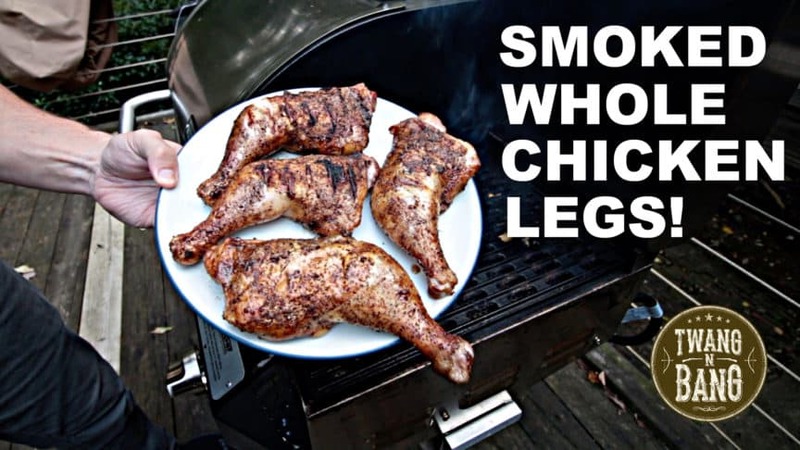 Place legs skin side up on smoker, and insert one temperature probe into the biggest leg and one into the biggest thigh. 10. Smoke on low smoke for 75 minutes, then turn smoker to 350 degrees. 11. Smoke until internal temperature reaches 160 degrees, then sear skin side down for two minutes.